London - September 24, 2013 - Aartform, the software publisher and development studio, today released a major new edition of its sketch-based sculpting program for Windows®: Aartform Curvy 3D 3.0. 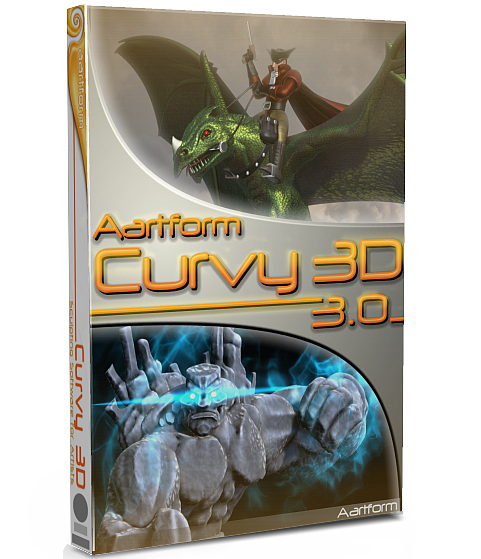 "Curvy is a 3D tool designed for 2D artists, with a non-technical interface making sculpting fun and easy." explains CEO Simon de Rivaz, "Curvy is great at organic art, you simply draw outlines to create 3D primitives then join them into complex models. Curvy 3D 3.0 adds advanced surface sculpting tools with Adaptive Subdivision dynamically dividing the mesh as you sculpt." 3.0 brings a modern GUI with an expanded toolbox, 5 new primitive types, and a powerful suite of new mesh editing commands. Among the new features are: multiple-selections; mesh masks; surface colours and ambient occlusion; realtime 3D shadows; mesh refinement and reduction; and seamless mesh welding. Sculpting in Curvy is a pleasure and you can now quickly draw and sculpt from you imagination or from references. Founded in 2003, Aartform has published a number of graphics tools. In 2009 Aartform launched a game development arm, Aartform Games.